Bayer – This company is especially fond of selling you and your children ‘vitamins’ full of toxic GMOs, aspartame, and carcinogenic chemicals, yet they call themselves ‘pediatricians number one choice.’ They have also been accused of coating 90 percent of their GMO corn seeds with bee-decimating pesticides, and they are in development for a new GM soybean that is highly toxic. Dupont Pioneer – This ‘trustworthy’ company had a market monopoly on gunpowder during the US Civil War, has developed nuclear weapons, and created Agent Orange, PCBs, and DDT, just like Monsanto. These defenders of genetically modified crops regularly claim that GM varieties of soy, corn, and other pestilence-inducing crops actually conserve soil because farmers don’t have to practice tilling in a way that causes erosion. They also lie that GMOs ‘conserve water.’ Well now, let’s look at those claims a little more closely, shall we? GE scientists paid by Monsanto were also found to have committed fraud in India. ‘Experts’ from the Indian Council of Agricultural Research (ICAR) and the University of Agricultural Sciences (UAS) have been found guilty of infecting and subsequently hiding the fact that indigenously created Bt cotton contained a Monsanto gene. These GE companies have secretly and stealthily planted poison crops all across our world, and our soil and water are being affected. Most alarming is the fact that GE crops affect soil fertility. In one gram of productive soil there is a complex web that can exceed over 100 million microorganisms that may represent over 1000 species. Monsanto and the biotech bullies are messing with those numbers. GE crops DO NOT conserve water. In fact, as super weeds develop, GE crops inspire farmers to try to irrigate their desirable crops, as any grower would – only they end up watering the super weeds. Water – from ground water to well water to lakes, rivers, streams, and even oceans – is contaminated with copious amounts of pesticides and herbicides that are used to grow GE crops as well. This practice ruins the water that we do have on this planet, making it nearly impossible for farmers in water-poor countries to grow anything. GE crops are in fact one of the biggest sources of water pollution in the U.S. and elsewhere. No matter how you slice it, the agricultural cake reeks of GM corruption and overt propaganda. 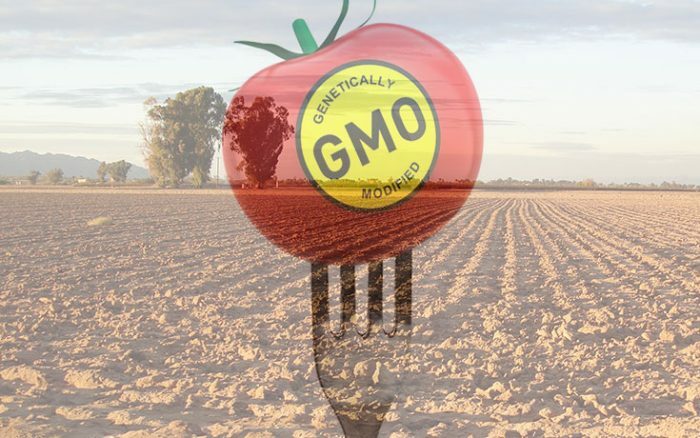 GMO crops don’t save our water – they contaminate it. They don’t protect our soil – they kill off the millions of tiny organisms that account for soil health. GMOs are not necessary to feed the world, and they have no place in our food supply. No more GMO! The valiant but highly superficial endeavor’s to insist on package labeling of G.M.O.s by corporate industry is at best a feel good preoccupation for many. Monsanto and company, countless scientists of all fields, and you and I all knew that once out, this dragon was not going back in the cage. WE WERE ALL WARNED. Just like a Pandora’s Box, once opened the problems and troubles unleashed are not going away now. It’s like posting a sign at a swimming pool, as to which is the non-peeing end of the pool, so you know which end to avoid. Fines, penalties, lawsuits, admissions of guilt and poor judgement, apologies, regrets, accusations and so forth do absolutely nothing but entertain the masses. Hanging these ENEMIES OF LIFE is a start, and a future deterrent to others, (and is necessary) but no remedy to what already is. There have always been and will always be those few, selfish dark souls that will if allowed, ruin things for everyone else. They are usually however kept in check and at bay, ALWAYS by those who refuse to pass off, underestimate or ignore them. The world dropped the ball here, and we’re all to blame for what is. The willfully controlled media, made it easy for the gullible masses to ignore the hidden real dangers and facts of G.M.O.s. Just imagine how different this world might be, if only people believed there REALLY ARE CONSPIRING INDIVIDUALS in this world. But to do that you must BECOME a full time conspiracy theorist, or more accurately a full time THINKER. To do that one need look no further than for COINCIDENCE. ***CONSPIRACY IS NOT MERELY AN OVERACTIVE IMAGINATION SEEKING TO COMBINE WITH COINCIDENCE. IT IS AN IMAGINATION THAT SEES TOO MANY COINCIDENCES AS RATIONAL POSSIBILITY. All you need is a mind *open* to all possibility, good and bad. All while Monsatan Employees eat only NON-GMO FOOD in Monsatan’s cafeteria! It’s a war of attrition against Humanity, being waged by the corporations, with complete complicity of the U.S. Government. Love the new look to the website! People need to realize the extent of damages that are being caused by these corporations.